A backpack with an integrated foldable rain poncho, a scarf with hidden pockets and a bubble wrap-inspired bag are some of the ten imaginative designs created by students at art and design university ECAL using a new waterproof material. 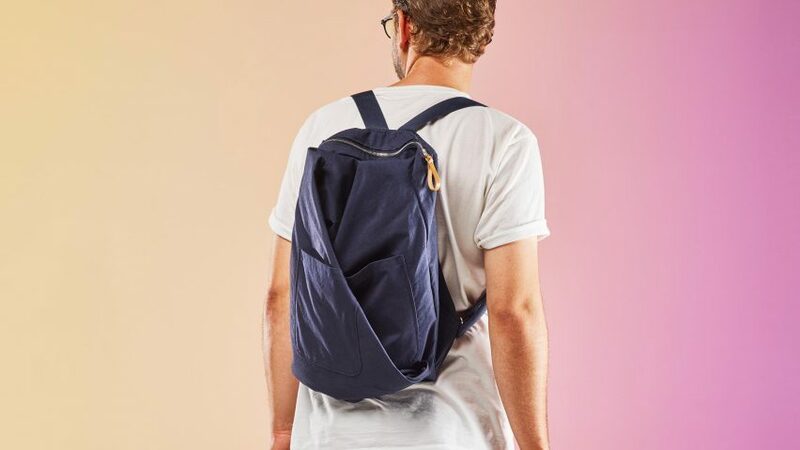 The students, who study on the University's MA Product Design programme, teamed up with Swiss bag brand QWSTION to create carrying devices made using a new sustainable and lightweight material called CottonShell. The material, which boasts a unique construction that makes it water resistant without the use of any coating, has only been used so far to make clothing. The project was led by Christian Paul Kaegi, a Swiss designer and creative director at QWSTION, who asked the students to use CottonShell as the starting point for their extensive research. "A good answer is the result of the right question," said Kaegi. "I think it's a really important part of studying to keep questioning the status quo, of society, technology and their relation." Prototyped solutions include Chelsea Park and Jakob Reuter's Big Fold backpack, which has an integrated foldable poncho to bring out when wet weather arrives unexpectedly. Yesul Jang and Kohei Kojima have created a sustainable camera bag with a single cross body strap for "the casual photographer". Taking inspiration from bubble wrap, Alexandre Picciotto and Thomas Missé created Dot Dot Dot – a padded, roll-top backpack with a bubble wrap imprint that keeps its contents protected. Called Four by Three, Oscar Estrada and Ignacio Merino's backpacking bag incorporates three different sized separate bags that are strapped together. Youjung Jeong and Mu-Hau Kao's Rain Umbrella uses the same spring steel unfolding mechanism as a photographer's reflector, while their shoe protectors consist of two CottonShell covers held in place by "slap bracelets" that wrap around the ankles. Designed for travelers, Catarina Pacheco and Sebastian Maluska's two-tone scarf has hidden pockets that provide easy access to personal items when on the move. A selection of the bags were exhibited last week at the designjunction show, as part of a display of Swiss design for London Design Festival. At the end of this week, the complete collection of ten prototypes will be showcased at the QWSTION Store during Vienna Design Week, which runs from 29 September to 8 October 2017. Also on show at designjunction was a levitating bubble-shaped "car of the future" designed by Central Saint Martins students and produced by Renault.